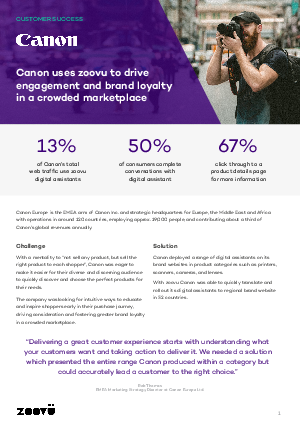 With a mentality to “not sell any product, but sell the right product to each shopper”, Canon was eager to make it easier for their audience to quickly discover and choose the perfect products for their needs. The company deployed a range of interactive digital assistants that engage visitors early in the customer journey and leads them to the ideal Canon product based on their unique needs. Download the case study to learn how your brand can leverage AI-powered digital assistants to engage customers early in their journey in order to boost conversion and sales.